Microsoft isn’t exactly known for championing open source projects. 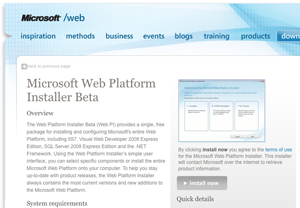 So it’s rather surprising (in a good way) to see the company release something called the Microsoft Web Platform Installer, which makes it possible to batch install a set of open source projects on Windows Vista or Server 2008. These projects include DotNetNuke, Drupal, Gallery, Graffiti, osCommerce, PHPBB, and WordPress. As InfoWorld points out, Microsoft itself isn’t technically the distributor of these projects since users are merely obtaining them from third party developers through Microsoft’s new installer. The platform is capable of running both ASP and PHP-based applications, and it consists of a suite of tools including Visual Web Developer for creating websites, Microsoft SQL Server for administering databases, and IIS7 for serving webpages. As such, the bundling of these open source packages is a rather clever way for Microsoft to promote the use of its proprietary server software over popular open source alternatives such as Apache and MySQL. Ironic, yes, but selective promotion of open source is better than none at all.